Very soon the front page of Reddit is going to start looking a lot different. For starters, there’s going to be a lot less partisan conversation around Donald Trump. In a post on r/modnews earlier today, the company revealed that its easily manipulatable voting algorithm is getting a complete overhaul. But that’s in the future. First the site’s front page, r/all, will be traded out for a new sorting method dubbed “popular.” Does any of this matter? It certainly does to the communities that won’t appear there. 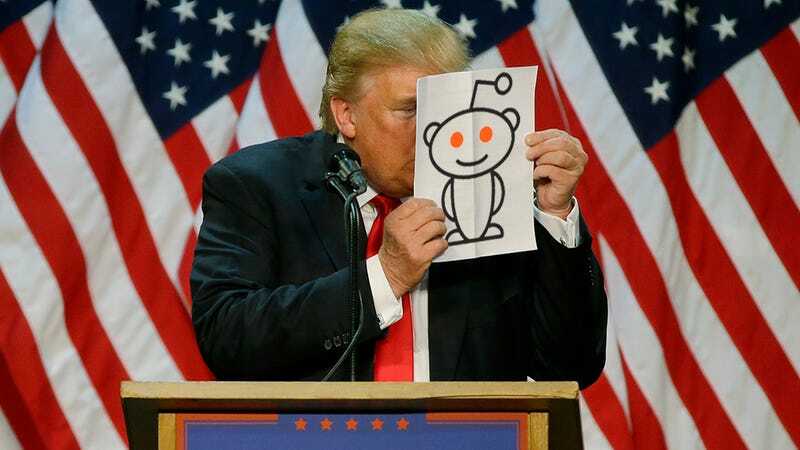 Back in November Gizmodo revealed that the internet’s biggest pro-Trump community, r/the_donald, was systematically manipulating Reddit’s voting system to take an undue portion of the site’s front page real estate. In response, Reddit gave users the ability to “filter” certain communities out of the mix. Which communities are banished from “popular” is, in part, a reflection of data gleaned from which subreddits were among the most filtered. Generally annoying communities like r/the_donald, equally irritating counter-Trump group r/EnoughTrumpSpam, and GamerGate hub r/KotakuinAction will no longer be foisted on logged-out users or those who never signed up for a Reddit account in the first place. The filtered subreddits also include gaming communities like r/Overwatch, r/DotA2, and r/hearthstone, as well as an assload of sports subreddits. Communities invited to “popular” will also be given the chance to opt out if they so wish. Trump will, of course, still feature heavily on “popular,” but as a result of highly upvoted posts from dedicated news communities instead of partisan political ones. Last week, Reddit finally took initiative and banned r/altright. In a statement to Gizmodo, the company noted that the white supremacist community had repeatedly harassed and doxed other users. Some members of r/the_donald saw themselves as next in line to be banned, others felt banning a 360,000+ subscriber community (which is the unofficial hub of the sitting president) would be too politically fraught. The latter may have been right. Instead, attempts by Reddit’s Trump supporters to game the system will be hobbled by a crackdown on vote manipulation before the wider algorithm change. Sure, they can still pile upvotes onto a post, but if it’s no longer taking up front page real estate seen by the majority of users, why bother? It’s not an outright ban. But in robbing them of the indignity and victimhood of a ban it might be a better move in the long run. The change to “popular” will take effect early next week.